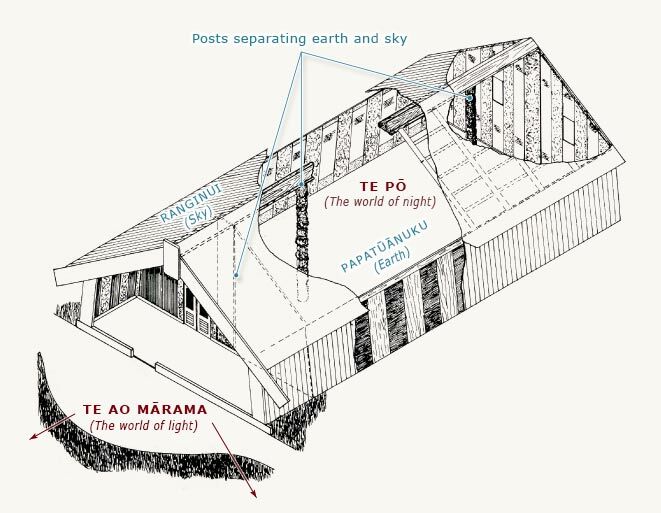 According to some traditions, a whare whakairo (carved meeting house) symbolically represents the Māori cosmology (view of the universe). Outside the house lies Te Pō, the world of darkness, while the interior represents Te Ao Mārama, the world of light, clarity and growth. The floor of the building is Papatūānuku, the earth mother. It is connected by pou (posts) to the ridgepole (tāhuhu), representing the spiritual connection between Papatūānuku and Ranginui, the sky father.